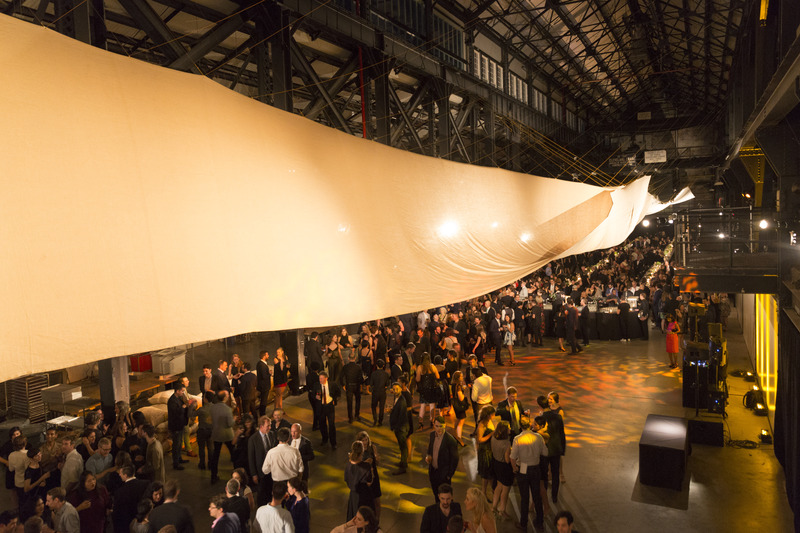 Brett Schneider (Assistant Professor, Architecture) and his co-designer Lizzie Hodges with RISD alumni Farinaz Moslemi and Andrea Kelly designed a site specific installation, UNPACKING, to transform industrial space at the Brooklyn Navy Yard for the Architectural League of New York’s 2017 Beaux Arts Ball. The installation used a calibrated rigging system anchored to the exposed steel structure of a former Naval Shipyard building and suspended a monumental burlap and canvas curtain that twists, unfolds, and sails along the 500ft hall to create soft rooms for the Architectural League’s 2017 Beaux Arts Ball. By day, the shipyard space houses a Chocolate Factory and using burlap—the material of cargo bags, rope and nets—links this current use of the space to a maritime heritage, and suggests that transformations out of the mundane can spring from opportunities teased out of unlikely circumstances. The installation was designed and fabricated over 6 weeks for erection over a day and a half before the Ball. 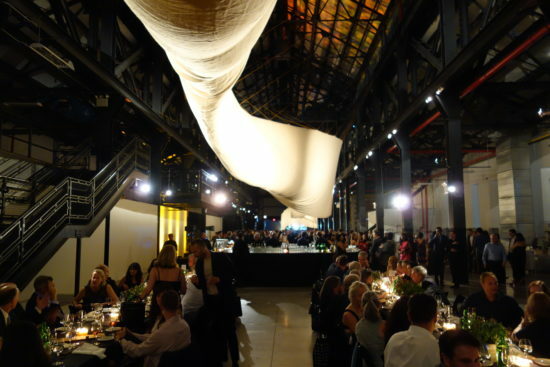 The materials used include 2 pieces of burlap each 17ft wide and 160ft long and 1 piece of canvase 15ft wide and 145ft long all suspended from the exposed steel structure of Building 28 using goldenrod colored paracord with webbing anchorages. This installation was a collaboration including a RISD faculty and students for design, fabrication, and erection of the project and included the support of the Department of Architecture who provided support to allow the participation of Moslemi (MArch ’18) and Kelly (MArch ’18).